The Super Swimmer is a very versatile bait, and can be fished pretty much anywhere. 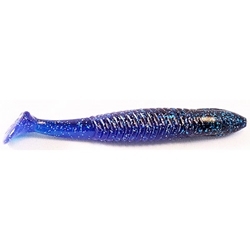 Its torpedo shape allows it to be very weedless and slip through all types of cover. It is 4.75” long with a hook slot in the belly. The tail, which is shaped like a colorado blade, puts out vibrations that the fish can feel from far away. The enticing swimming action makes the bait look natural. You can swim the Super Swimmer fast and on top, or slow down and enable the bait reach different depths. It is best rigged texas style with a variety of bullet weight sizes, and a 6/0 EWG hook.